If I had to choose I reckon I would choose a lime over a lemon anytime. They just seem a bit more special somehow. 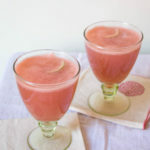 I’ve seen plenty of recipes for homemade lemonade but not that many for homemade limeade. My basil lemonade with lime is such a refreshing summer drink. I actually ended up using a mixture of lemon and lime juice to make this, mostly because I ran out of limes. If you give your limes a quick blast in the microwave before squeezing them you’ll get much more juice out than if you squeeze them cold. Who knew I gave out useful life tips? You’re welcome. Put the basil and sugar into a jug and bash it together with a rolling pin or muddler until the basil is well bruised and it smells lovely. Add the lime and lemon juice and stir it all together until the sugar is dissolved. Add some ice to the jug and top up with the sparkling water. Give everything one final mix then pour into glasses and serve. Trust me on the basil for this, it gives the drink a really interesting flavour; sort of floral and quite earthy. 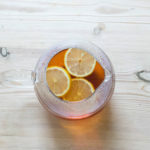 I made this quite strong as I prefer a mouth puckering, not too sweet lemonade but you could add more or less sugar and juice to suit your taste. I have made this with flat water but I do think that the sparkling is slightly better. 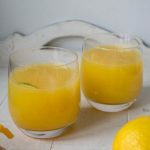 It’s really refreshing and ideal for a warm evening but I will definitely make it later on in the year as a citrus pick-me-up.